The view and mood in the pit are a little different than from that on stage or even backstage. What follows are the pit chronicles from yours truly, the lead clarinet player, running up through the glorious opening of this very special show. Warning, this is a fairly long piece. This was move-in day, and the orchestra members started trickling in early afternoon. Music Director, Kevin Surace had set the music stands, chairs, and mics in place in the pit a week before. 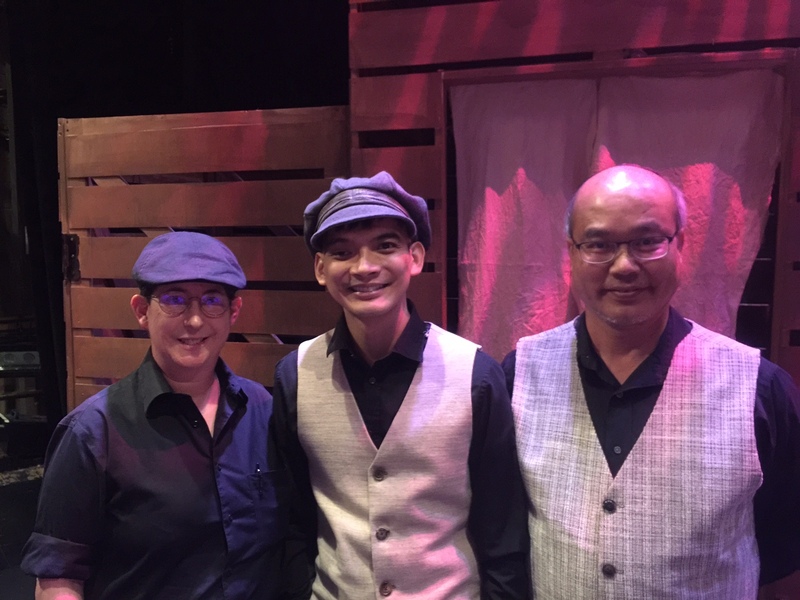 He had already been at the theatre for several hours this first day of tech working with the sound crew to ensure that all of the sound equipment was configured through the board by the time the musicians arrived, but the real test was still to come. 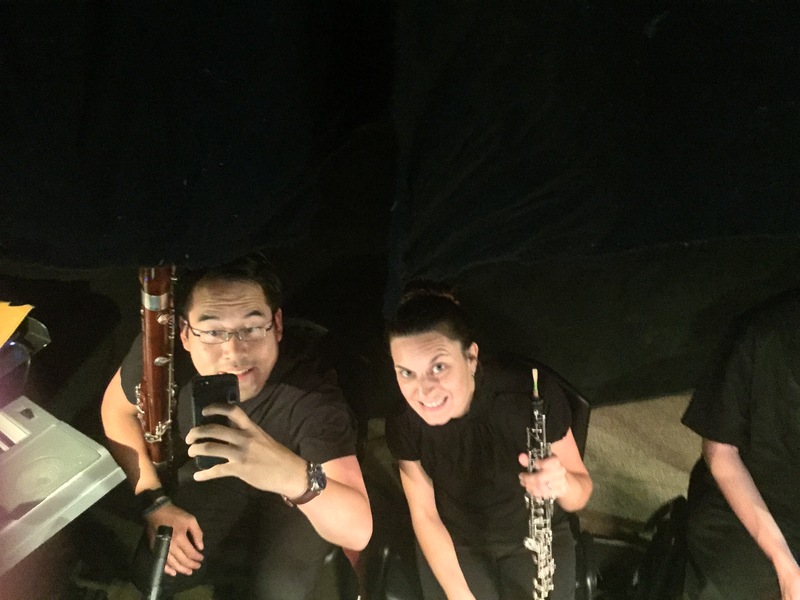 Starting a little before the musician call time, as each pit player got their instruments set up, they were asked in turn to test sound levels on their mics. For acoustic instruments, they either had a standing mic, or a clip-on attached directly to their instruments, and electronic instruments were fed directly into the mix. 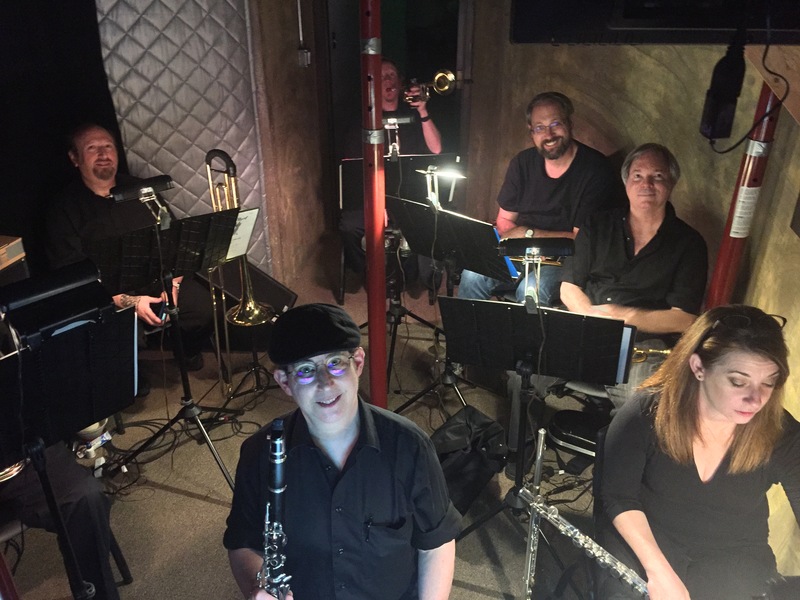 Once all the members of the pit had tested their mics, a few more than once, then the pit including the rhythm section, brass, and woodwinds played the Exit Music to test the levels as an ensemble. After the first few times, Surace climbed out of the pit. As would be the case going forward, his normal path of ingress and egress to and from his platform was climbing along the pit wall between the stage and the platform because he couldn’t get down to the floor of the pit without moving a couple of musicians, stands, and chairs out of the way. If nothing else, he provided a bit of entertainment for the pit as we watched him literally climb the walls. As Surace went into the house, conferring with the sound crew as they tested and adjusted the sound levels, I was requested to restart the pit playing the chart several more times. Eventually, we got tired of playing the Exit Music (after at least the 15th time), and we switched to the Bows for another dozen or so runs-through while the sound design team continued to make minor adjustments to the house mix. After Surace and the sound designers were happy with the levels from the pit, Surace repeated the process with the strings on stage. One by one, they tested their individual mics, and then played the Bows several times as a string section. Eventually, Surace bounced back down to the pit, and we played the Bows several more times as a complete orchestra. After this, Surace again climbed up on stage. The pit was asked to play the Bows a few more times so they could adjust the backstage monitors to allow the cast and strings to hear the players in the pit. The Bows hadn’t yet been staged, but everyone in the company knew every measure after this lengthy display. Finally, the orchestra got a short break when the cast arrived, as we’d been playing for almost two hours, and at least the winds and brass players needed to rest their chops for a few minutes. 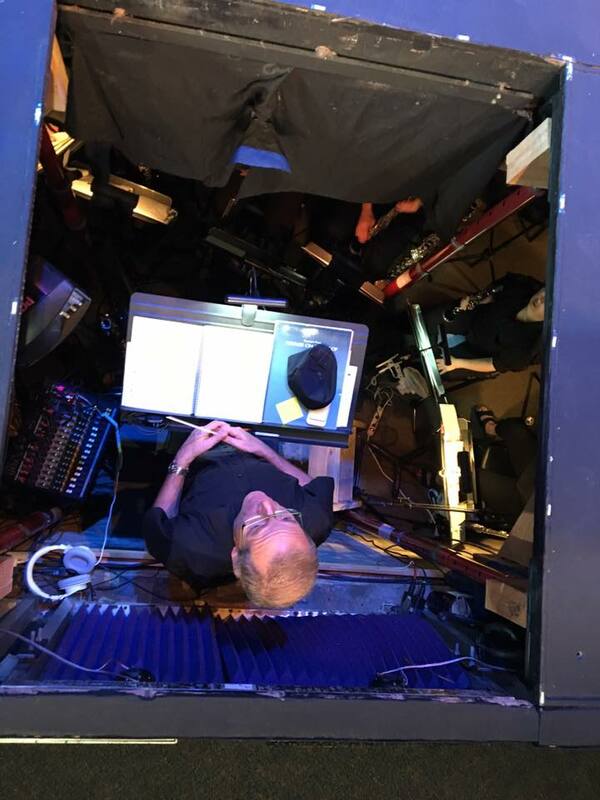 The rehearsal picked up with orchestra and cast combined playing Tradition, Sabbath Prayer, and Sunrise, Sunset, co-director Steve Shapiro at the helm on the platform while Surace continued working with the sound design team. 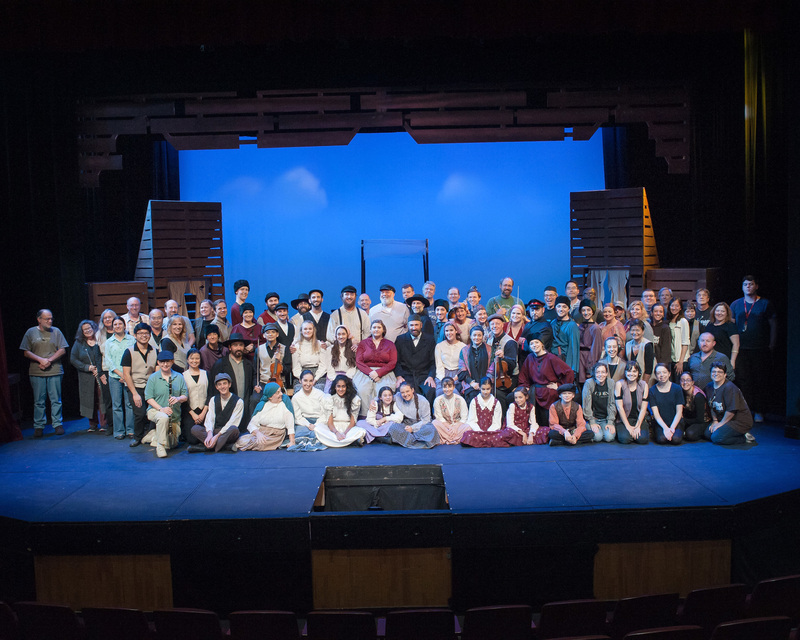 The cast then took a break, Surace climbed back down into the pit, and the orchestra played the aforementioned John Williams piece, Excerpts from Fiddler on the Roof, giving the rest of the company a nice concert. One thing was a bit of a surprise to many of us that night. Although it had been SCP’s practice for at least a year, the cast’s mic table was setup in the hallway in the pit. This is a narrow area previously used to store cases and is the only access route the musicians have to the pit. That said, this would become an ongoing congestion point as cast members congregated to attach or remove their mics while musicians were either trying to get into or out of the pit. Early in the week, the walkway was even narrower than usual because there were several cable boxes on the floor against the wall leaving only a narrow gap large enough for a person to either stand at the mic table, or walk through, but not both simultaneously. This wasn’t as noticeable in past shows because cast call was much earlier than the orchestra’s, and once the shows were in production, the cast members would normally be busy with a meet and greet at the time the musicians were putting their equipment away and leaving the pit. This was a long night. A massive thunderstorm blanketed the area (unusual for the SF Bay Area), making it difficult for some of the orchestra members to get to the theatre by the appointed hour. Once a quorum was reached (with a couple of musicians still braving the storm and the traffic snarls), the rehearsal began. After tuning and checking a few mics, the first 90 minutes or so were spent playing through the John Williams mini-symphony multiple times. 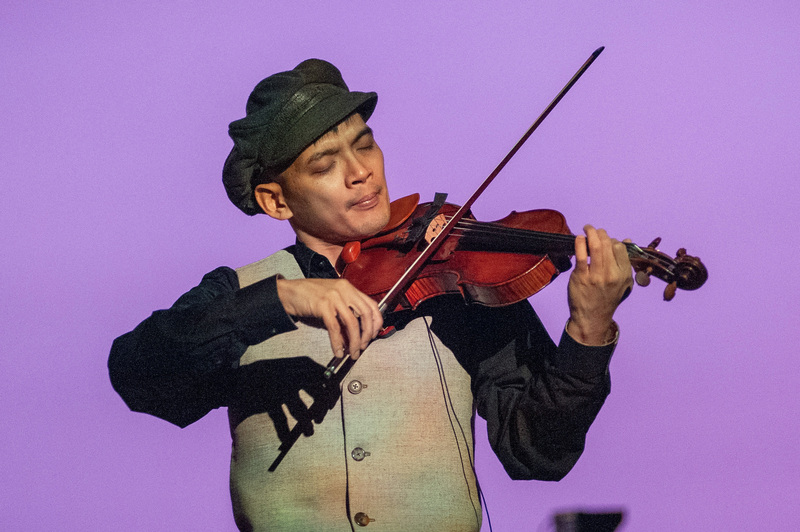 Each time, the piece was recorded by a professional film crew from a major national magazine for an upcoming feature article profiling the production’s virtuoso violinist, Eric Sun. The last time through the piece, the cast had arrived and was sitting in the house providing the applause at the end of the video above. Once that was completed, the entire company settled in for the cue-to-cue, jumping through book scenes, and playing every transition and musical number as all the technical elements were pulled together. Inside the pit, this was an unusual experience. While the strings onstage had monitors to hear the pit, the reverse was not true for this rehearsal, at least through most of it. The woodwinds, brass, and rhythm section members residing in the pit couldn’t hear the strings for the bulk of the night, giving many numbers an odd, eerie texture. The orchestra got a bit of a reprieve this night, arriving much later. The musicians started with a few mic checks, and then several iterations of the Exit Music and Bows to check the overall balance. Once that was completed, the run-through commenced, this time with monitors in the pit. During the wedding sequence, the pit members were jarred almost out of our seats. The pogrom that takes place is a frightening scene. When the wedding table was toppled, it fell directly over part of the pit, and it was quite loud down there as the thud echoed and stopped our playing. Fortunately we were supposed to stop playing there, but we hadn’t expected to have quite so dramatic a cutoff. 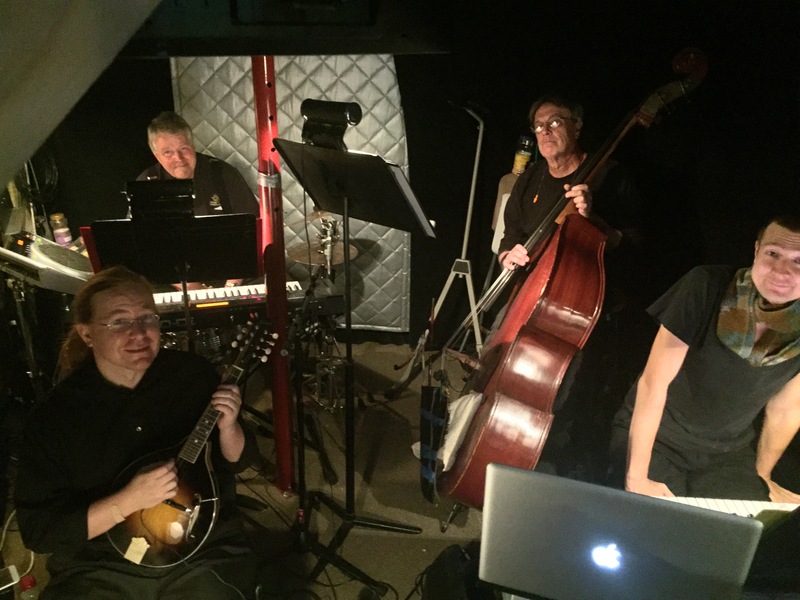 Midway through the run-through, a deafening feedback loop struck the pit, and the rehearsal was halted until the source could be determined and adjustments made. Unfortunately, this meant the end of the monitors for most of the pit members. It was a long night. The orchestra arrived early, ready to polish, and polish we did, but not until after being banished from the pit so the crew could remove the one pit cover over the conductor’s platform. The removal had been delayed because a city inspection was in progress. We eventually were allowed to do the work we’d arrived early to do and commenced musical polishing. Several timing issues were resolved over the next 50 minutes or so, prior to some more detailed mic checking from the pit. The cast joined in the fun, and a few scenes were restaged due to an emergency cast substitution with only three days until opening. The original actor playing the rabbi had been injured the previous night and would be unable to perform during the run. Also, understudies are not the norm in community theatre, so this could have been a disaster. Fortunately, co-director, Steve Shapiro stepped in to fill the role. 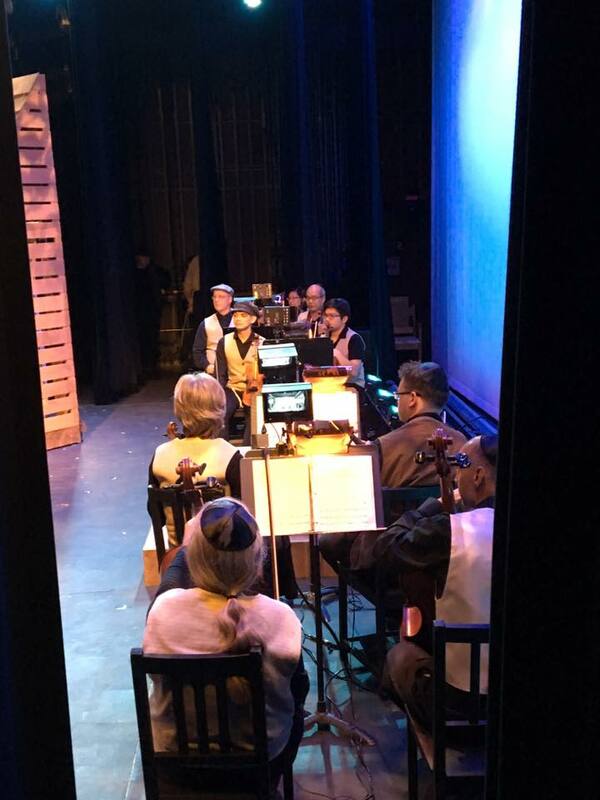 Once the scene restaging was complete, the bows were staged and run with music a couple of times before it was finally time for our first full run-through. At this point in the week, though the strings had been in their blacks for a couple of nights already, they were now fully costumed with matching vests to better blend into the setting. The pit members wouldn’t don pit blacks until Friday’s preview. The entire show ran smoothly overall with only minor hiccups, but it was close to midnight when we hit the final note of the Exit Music. Throughout the night, photographer Lyn Flaim Healy was taking production photos of the stage action. From my seat in the pit, I could see her moving around the front of the house setting her shots. And those of us in the pit, while certainly heard, remained unseen by the camera. The orchestra had a lot of waiting this night because the rabbi was still being worked into scenes. The musicians were finally pulled into action after waiting for almost an hour after our somewhat later call. After playing the musical portions of the restaged scenes, it was time for another complete, and very smooth run-through. In fact, this was the best run-through to date. The pit even had the string monitors back briefly, but that was to be short-lived. Intermission allowed for a bit more mingling between the pit and everyone else as this was also company photo night, though the pit dwellers didn’t know about the photo ahead of time and weren’t exactly dressed for the occasion (i.e., not in orchestra blacks). The strings, being on stage, were very nicely appointed in their Anatevka-approved attire and bended right in with the village. The orchestra was called at what would likely become the nominal performance call time, but we didn’t actually do any musical polishing for another half hour. We were in rapt attention, only playing a wee bit during the warm-up period. We were then ready to face our very first, very friendly audience. As the clocks struck the appointed hour, the house was filled with invitees waiting eagerly to see what we had all worked so hard to produce. The show began about 15 minutes late, but that didn’t detract from the excitement. Something magical happens when an audience fills the house and the energy tingles as the Fiddler sweeps his bow across the strings for the opening strains of the all-familiar leitmotif, Tradition. There were only a few minor mic pops and last minute adjustments during this preview, at least we thought that was all it was. Unbeknownst to most of us until well after the fact, the sound equipment had been completely disconnected up in the booth earlier in the day by somebody outside of the company working through the city. As a result, Surace and the sound engineers were scrambling to get everything restored prior to running the preview. Throughout the night, the pit’s string monitors were not quite where they needed to be, but because of placement (the only places they could be), those would never be perfect for the entire pit. In fact, it appeared that steady state would mean that only a couple of the brass players and the music director would hear the strings through the monitors in the end. As always, for musicians, it’s incumbent on us all to watch our music director and not rely on what we hear. He carries the big stick to keep us all in sync if we all just watch him, and for preview, we did. For those unfamiliar with stagecraft, actors’ mic pack covers are repurposed items intended for a very different type of protection. 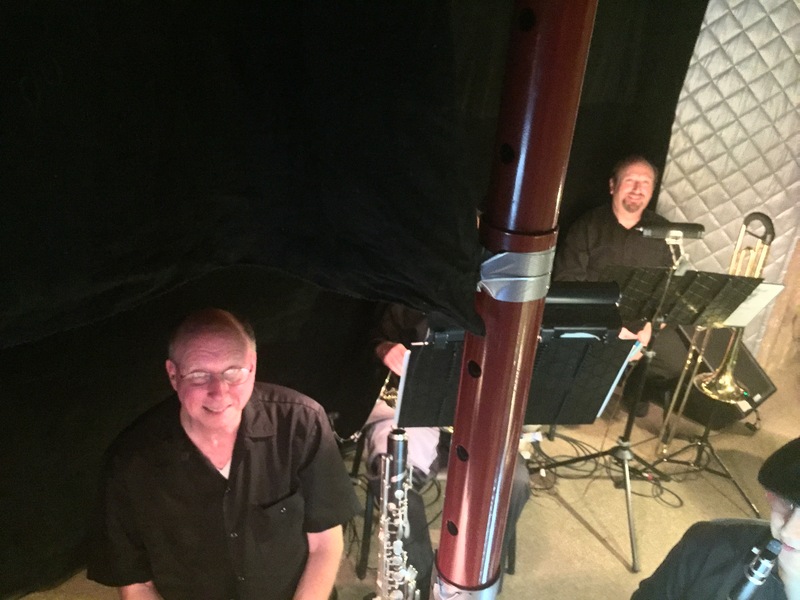 Suffice it to say that our cast, like many others, practiced “safe sound.” Of course, in the hands of devious musicians, they are anything but safe, so one of those covers kind of floated around the pit for much of the week. In spite of some scrambling, of which the audience was completely unaware, the preview was a rousing success, and we were ready to officially open the show. “Four weeks you rehearse and rehearse. Three weeks, and it couldn’t be worse. While that depicts the extreme case, this production didn’t have a “worse” part. It did have a few challenges, but all in all, most of the challenges had been on the tech side, in part because of the unique sharing arrangement of the theatre itself. We know the ending from the beginning of this article, but even this wondrous night didn’t start there. Oh, the buzz was there from the time each member of the pit (and the rest of the company) got to the theatre, but there was still much to be done before the proverbial curtain rose. Before the show, we had the usual warm-ups, and then, unlike every other night, we had a company call on stage. Matt Welch, one of the co-directors, ran an exercise with the whole company that he had run with the cast before, but this time, everyone – cast, crew, orchestra, and staff – was involved. We may all have been tired from the long hours during tech, but this exercise served to energize every performer in one way or another as we all interwove on stage, passing one another, hugging each other, actors getting into character, musicians absorbing the colors and expressions of the village of which they were now a part. Before the house opened, the Gypsy Robe was then awarded to the outstanding ensemble member, who this time was clearly Eric Sun. His story is in the program (and in my aforementioned background piece), and there were tears and cheers from the company at this point in the evening. We were wired and ready to bring our show to the audience. And how did we receive two standing ovations per performance? The first was for the intermission entertainment featuring Eric Sun playing the cadenza written for Isaac Stern. The second was in the traditional spot, during the bows. As a follow-on, we received two more standing ovations in the exact same places the second performance of the run from another sold-out house during our first Sunday matinee. 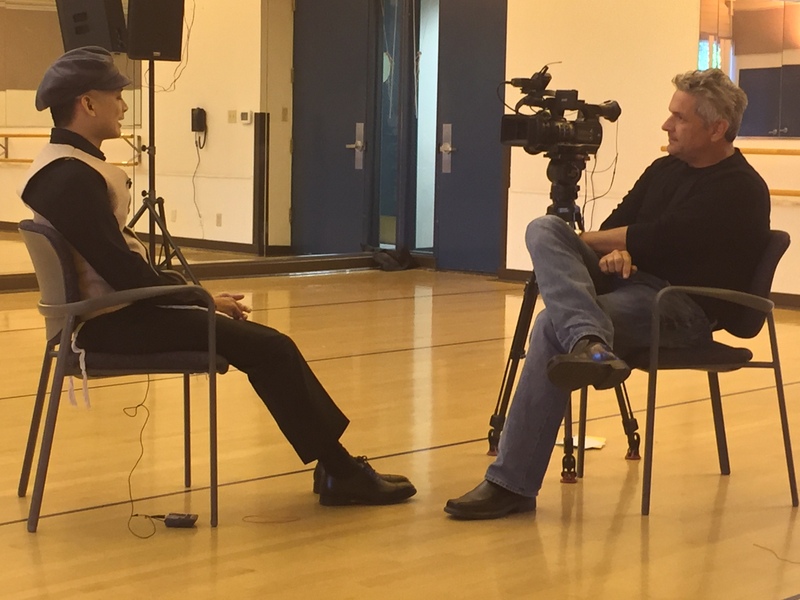 There was also a feature story with NBC Bay Area filmed that day, and the piece aired this week. The show is open and off to a great start, continuing Thursdays – Sundays through 8 October 2017. Don’t miss this extraordinary production, and get your tickets soon as they are selling quickly. Performances are at the Sunnyvale Community Center Theater located at 550 E. Remington Dr., Sunnyvale CA 94087.